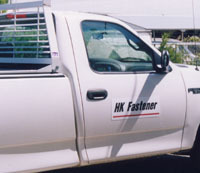 HK Fasteners & Supply, L.L.P. We offer free local delivery for your convenience. Our fleet of trucks can deliver anywhere in Central Texas, usually with same-day service. Just call us at (512) 989-8903 for more information. Copyright © 2000 HK Fastener & Supply, L.L.P.